Surfing the Analytical Wave! - Invest in the Salesforce Analytics Cloud? It would be fair for me to say that Wave is not only disruptive, but in a lot of ways, it is almost path breaking. 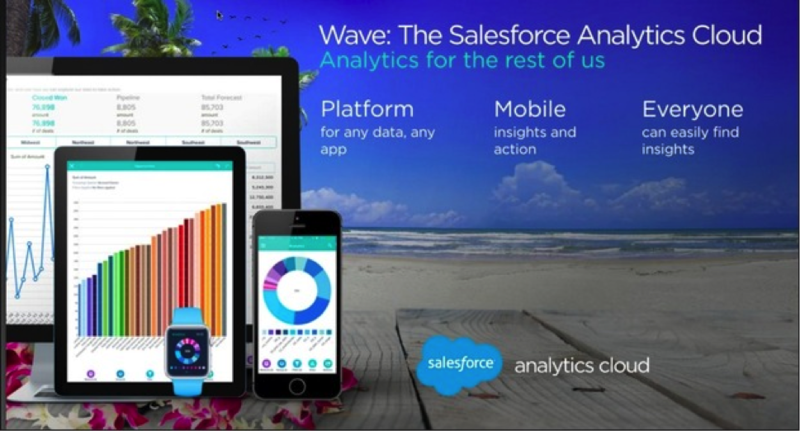 In the months to come, organizations using Salesforce or analytics in a big way will spend considerable time choosing whether or not to ride the Wave. In this blog, I have tried to enumerate all the key factors that you as a business or someone using either Salesforce or analytics should consider, before you decide one way or the other. 1. Mobile and Tablet Interaction! Which is not to say that it is not for desktop users, in fact, it has quite a commendable interface for desktops and laptops. However, Salesforce understands that your mobile workforce needs access to key insights on-the-go and therefore Wave has five simple smartphone buttons for filtering and grouping data for analysis: filter, group, measure, view, and drill, these all cover the majority of analyses your users would need. Lately, a lot of analytics providers have tried to make their apps mobile-ready and dabbled with state-of-the-art, flashy graphics to make their apps intuitive and attract the users. It is fair to say though, that Salesforce, with its vast base of enterprise users has the scale and ability to drive the user adoption. 2. God is in the UI! Wave’s UI (user interface) shows that Salesforce understands that the only way to get the masses all gung-ho about analytics is to provide a user experience they cannot resist. The interface is fluid and seamless and as Stephanie Buscemi, senior vice president of marketing for the Wave effort admits, Wave is based on the concept of instant gratification that forms the core of video games. So you can choose from a number of visual representations, see your charts form and dissolve real-time as you group and filter to the next level, and take actions instantly! Personally, I was absolutely enthralled and found the overall UI totally out-of-this-world! Yeah, it is THAT good! See for yourself here! I can already see the competition spending sleepless nights to match up to this level of ease of use and what I term as an absolute user experience! So Wave is mobile-centric and has an absolutely amazing UI. What makes Wave irresistible is not just its UI, but also the fact that it powers so much into your smartphones through its large number of features. You are no longer dependent on your BI team to get you the desired reports, Wave empowers you to get it for yourself, from your own device! You can mash-up datasets and create dashboards with equal dexterity and acquire and share findings on the go. Wave’s role-based hierarchy controls that right people have access to right data and supports not only data from your Salesforce but also from diverse data sources like Microsoft, SAP, Oracle etc. You can also share the data through Salesforce Chatter with all of your connections. Here’s the good news for your technology people; Wave is based on a key-value-store, NoSQL database. Since there are no predefined schemas or a fixed database model, your technical team does not need to spend a lot of time extracting, filtering and transforming data from multiple legacy sources. You can quickly bring in your data residing in external data sources into Wave and get started in no time. This schema-on-read approach allows you to drill down to the desired level and not be limited by predefined, rigid traditional data models. 5. It comes at a cost! If you are looking to ride the Wave bandwagon, you need to get a Wave platform license required to get started, which is said to be in the range of roughly $40,000 per-company, per-month and includes all computation based, data management, API and security infrastructure. Additionally, Wave "Explorer" business-user subscriptions including the ability to view, discover, personalize and share data insights and dashboards will be $125 per user, per month, while "Builder" admin/power-user subscriptions including the ability to create, deploy and manage data sets, data connections and user access will be $250 per user, per month. Although I am positive that in time these prices will come down, at the onset, Wave looks to be primarily targeted at large enterprises. So if you are a SMB, you probably need to reshuffle your IT budget quite a bit before you take the plunge. Although it is difficult to predict just yet the extent to which Wave will impact the analytics space in the years to come, I see Wave as a good thing for BI customers, creating quite a stir in the Analytics market. It promises to improve data management flexibility and simplicity at a time when customers are bored with the archaic way the business intelligence space has been functioning and looking for multiple, innovative ways to visualize their data. After all, we all could do with some game-changing waves!